(1) Editorial: Could Good Bacteria Hold the Key to Our Bladder Health - With the advent of new urine testing (Next Generation DNA Sequencing), we've learned that not only is urine not sterile but that the bladder contains many species beneficial bacteria. We are also now coming to understand the catastrophic damage that antibiotic use can cause to our beneficial biome. In the near future, we may be fighting pathogenic infections with beneficial bacteria. (2) An IC Awareness Patient Story: I am A Warrior Battling IC - IC Awareness Month begins September 1st. In this issue we share several patient stories that were submitted by patients to further the cause. 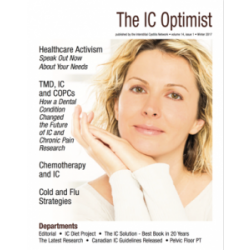 Teri has written a fabulous article about her experiences as an IC patient. We hope that it will inspire you to participate in this years campaign. (3) Inside AUA 2018: Chronic Pelvic Pain Course Highlights - Hundreds of urologists attending a fabulous course on IC, chronic prostatitis and vulvodynia taught by Robert Evans MD, Robert Moldwin MD and Jennifer Fariell-Moldwin. We share the course highlights and a series of case studies that demonstrate that many patients thought to have "bladder" disorders actually have pelvic floor muscle dysfunction instead. 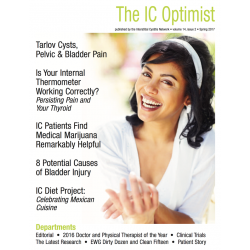 (4) An Unusual Cause of Bladder Pain - We share the story of an "IC" patient who is now symptom free after the discovery of sharp crystalline stones in her bladder. (5) New Urine Test Reveals Chronic Bacterial & Fungal Infections - An interview with Rick Martin, CEO of Microgen DX, who discusses Next Generation DNA Sequencing (NGS) urine testing. This affordble test will reveal all organisms in your urine, including beneficial and pathological bacteria and fungi (i.e. candida). It’s the wave of the future! (6) Exploring the Mysteries of IC: A Ten Year Progress Report - Stacey Shannon covers the ten year anniversary of the MAPP Research Network, the leading research network for IC/BPS and chronic prostatitis. We've learned so much from their studies so far, including the fact that some patients flaring may have an overgrowth of candida in their urine. (7) Clinical Trial Update - Aquinox Halts All Rosiptor IC/BPS Research - Sadly, the latest round of research for Rosiptor showed minimal effectiveness for the treatment of IC despite several early studies which did. Was it a study design flaw? A subtyping error? We share their info and our letter to the CEO of the company. (8) Swimming Safety - If you love hanging out at the pool every summer, you’ll find ten swimming safety tips. A new CDC report confirms what several IC patients have shared... that pool chemical injuries have happened to many! (9) IC Awareness Month Patient Stories - Read more than a dozen patient stories that, I hope, will motivate you to participate in IC Awareness Month. We must educate as many patients and providers as possible so that patients are treated with the kindness and compassion that they deserve. (10) Self-Help Tip: Constipation Strategies - Do you take medicine that triggers constipation? If so, you are not alone. Unfortunately, many of the meds prescribed for IC/BPS and, of course pain therapy, are well known to cause bowel symptoms. We review some of our best self-help tips here!